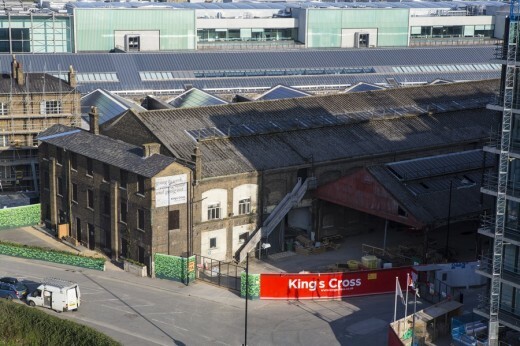 Upon completion in 2015, the redevelopment of Midland Goods Shed will create an innovative new focal point for King’s Cross, within the heritage core of one of London’s most dramatically changing neighbourhoods. 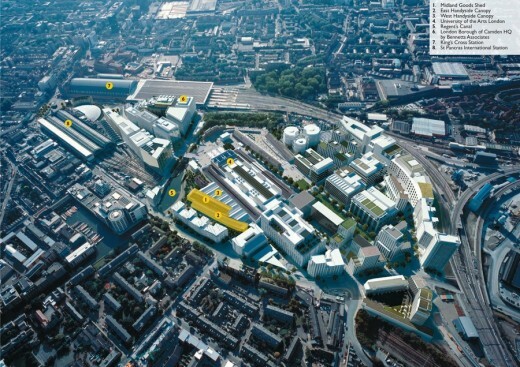 Bennetts Associates’ 62,000 sq ft scheme imaginatively converts historic railway structures to contain a unique mix of uses: a 29,000 sq ft Waitrose concept supermarket, a 2,400 sq ft cookery school and a 30,000 sq ft events and educational venue. 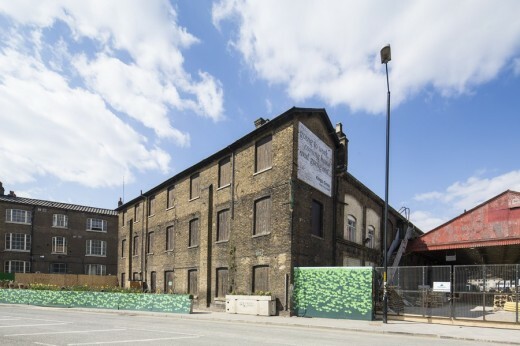 Dating from 1850, Midland Goods Shed and the West and East Handyside Canopies sit as part of the Grade II listed Granary Complex within the Regent’s Canal Conservation Area towards the north of the King’s Cross development. Next to University of the Arts London and the main north-south pedestrian thoroughfare, it is one of the last heritage buildings on the site to be brought back to life. 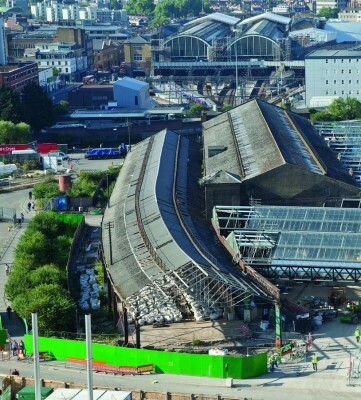 Its location above the Victorian Gasworks Tunnels serving King’s Cross station requires all new works and loadings to be very carefully considered. The main entrance to the Waitrose store will be at the southern end of Midland Goods Shed, facing the major north-south pedestrian route through the masterplan site and providing good access from York Way via Wharf Road. Given the superb public transport connectivity in the area, the store will not have car parking provision. Public areas of the store sit across the ground floor of the Goods Shed and the southern end of the East Handyside Canopy, creating two distinctly different spaces that the store planning will respond to imaginatively. 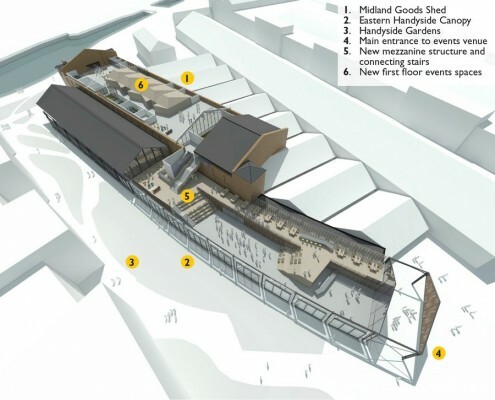 The area within the Goods Shed has the potential to spill out into the adjacent West Handyside Canopy for covered markets and food festivals, whilst part of the East Handyside Canopy will house a store café with an outdoor seating area overlooking the canal. 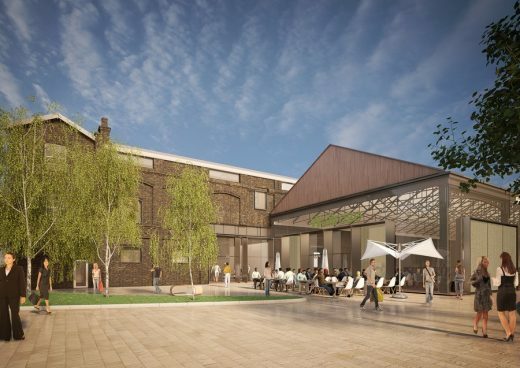 The cookery school will be located in the south east corner of Midland Goods Shed and will provide a complementary education and leisure resource as part of a food destination emerging in the area. 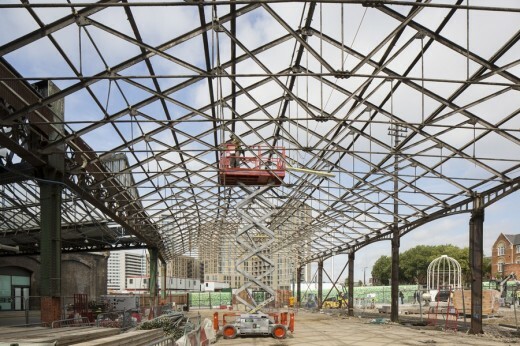 The first floor of Midland Goods Shed, as well as the remainder of the East Handyside Canopy, will provide new events and cultural space for a major media organisation, thus adding to the Learning Quarter already established at King’s Cross. The scheme preserves the buildings’ varied and idiosyncratic Victorian character of robust brickwork, thundering cast iron structures, cavernous spaces, delicate roof trusses and the majestic sweep of the East Handyside Canopy. • Enclosure of the East Handyside Canopy with a delicate glazed elevation that allows the historic structural features (such as cast iron arches) to remain visible from outside whilst also elegantly incorporating areas of solid and gently reflecting the new Handyside Gardens adjacent. • The introduction of a mezzanine level to connect the two levels and spaces of the buildings and provide additional accommodation at the northern end. • Infills to the Midland Goods Shed façades comprising full glazing to the supermarket shopfront and robust steel panels elsewhere, with a similar architectural language to that of the Granary Building opposite. • Introduction of a new pitched roof at first floor with courtyard gardens inset to add light and amenity. • Commemorating the pivotal role that hydraulic power used to play within the former goods yard by allowing building users to experience the Accumulator Tower as part of the new vertical circulation arrangement. The nature and mix of uses, together with the design solutions to accommodate them, will allow the public to experience these charming historic buildings for the very first time.